Why hello, lovelies! I haven't stopped by much at all this week, but how about I fill you in? Operation: Complete Visa is in full swing. We have filled out all of the forms, wasted thousands of trees (so sorry, environment - I think the Immigration Department is out to get you!) printing off proof documents, have our beautiful family and friends madly filling out statutory declarations (thank you all, I love you and I promise you will have VIP seats at our wedding), have paid visa fees, booked medicals and pulled about 306 hairs out of each of our heads, respectively - and I probably have a few grey ones too. But it's all good. We're excited and ready to see how long this takes. We are hoping for not very long at all as everything is completed, but you never know! I have spent the morning on the phone to my incredible future husband finalising everything so I'm having a superb day! 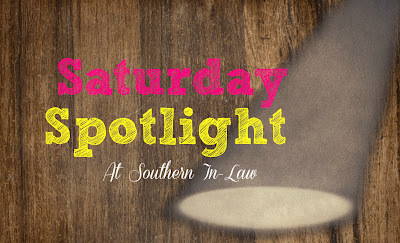 But something else fantastic that has been happening lately comes from Choices Gluten Free Bakery. If you can't eat gluten, think about this; you take a piece of bread, pick it up, put it in your mouth, take a bite and cruuuuuuuuuuunnnnnnnnnch. Don't worry, you're not going to be feeling rotten in a few hours because this bread is gluten free. That can't be true?! That's what I thought a few weeks ago. However, Choices know their stuff - and they do it magnificently. Their bread is so good that I would seriously be happy if someone bought me a loaf or a baguette as a present. It's that good. Their Baguette is deliciously crunchy when popped into the oven to crisp and freshen up and their English Muffins toast beautifully with the perfect crusty edges. Choices have four bakery stores across NSW and deliver their bread to different parts of the country. They are made fresh each day and then shipped off or bought in the stores - and oh are they good! The Classic Loaf is your basic gluten free white bread that is great toasted. I wasn't so much of a fan fresh, but when toasted it was divine! If you don't want to toast it, pop your slices in the microwave for a few seconds to freshen up and you're good to go. My favourite of this bunch had to be the baguette. 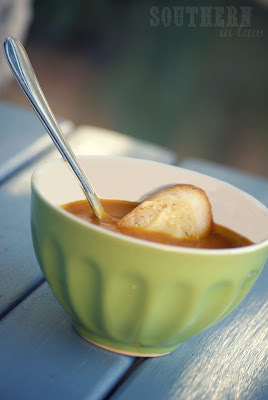 When it was warmed in the oven it was crunchy and delicious and perfect for dipping into soup! 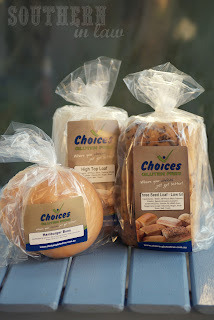 My second delicious delivery from choices included the Three Seed Loaf, Hamburger Buns and the High Top Loaf. Let me tell you about the Three Seed Loaf. Holy gluten free heaven. Eaten fresh, it's delicious - freshened in the microwave, delicious - toasted, delicious. It can't lose. If I ever won the lottery, I may just eat only this bread for the rest of my life - or buy a never ending loaf. A-maze-ing. I gush, but seriously - if you were previously a fan of seedy grainy breads and can no longer eat them (as I was), do yourself a favour and order a loaf ASAP! The High Top Loaf was also delicious! Crunchy with that delicious chew on the crunch and great toasted or fresh! The Hamburger Buns would be perfect for entertaining, just pop them in the microwave to freshen up, add your fillings and you're good to go! I'm not a hamburger bun but I just filled mine with regular sandwich fillings and it was perfect! The best thing about Choices Gluten Free (other than their yummy bread, of course) - they get food intolerances and allergies. I can sometimes feel like a hassle having to check things for ingredients (which often involves contacting companies), however, choices have everything written up on their site - you can even search for products by allergies! All of their products have no artificial colours, flavours or preservatives and none of the above breads made me sick. None! They're made in a strictly gluten free facility so there's no contamination - and they're serious about keeping potential contaminants away from other breads. So what's my verdict on Choices? Please go buy some for yourself - ASAP! Especially that three seed loaf, mmmmmmmmmmmm. 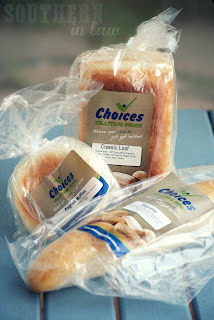 I received the above gluten free bread products from Choices to try. The opinion expressed above is completely my own - and I honestly am an incredibly satisfied carbaholic who will stick with Choices for years to come. Don't worry about killing trees, most paper is made from sustainable resources anyways. Don't ever come to my work if you are worried about tree murder. I'm drowning in paper! Good to know there are great products for people with intolerences!